I had this great idea to make waffles in the morning so I pulled out the ingredients only to find I had no eggs. Oops, change of plans, will that be toast and cereal again kids? It must have totally slipped my mind that I had no eggs in the afternoon because I announced that I was making cookies, trying to drum up help support for the event. Until I remembered that I was back to the no egg situation and stuck at home without the car to boot. No problem, we would just walk to the nearest grocery store for a dozen oval shapes, er...one problem, it was raining and I still have no idea where the rain coats are or if they even fit. I didn't want to go down without a fight so I racked my brain trying to figure out a sweet treat that I could make that I actually had ingredients for. 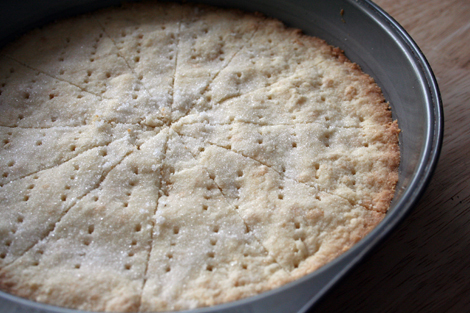 It dawned on me, the blessed shortbread. God bless the Brits and their endless need for tea and shortbread and thank you dad, for giving me your sweet tooth. I found my recipe and went right at it. Not much in that recipe I tell you, but taste buds get ready for a real buttery, sugary fix, especially with that extra sprinkle of sugar on the top. This mumma does not disappoint I tell ya (you can roll your eyes here). Preheat oven to 350 F. In a large bowl with medium speed beat the first 6 ingredients until well mixed, occasionally scraping the bowl. Pat dough into two 9-inch round cake pan and with fork, prick well. 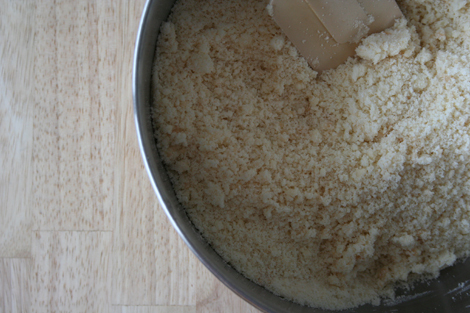 With spoon, sprinkle sugar over dough. Bake 30 to 35 minutes. Cut into wedges while warm. cool on wire rack; separate cookies. Enjoy. disclaimer: I can not be held accountable for the numerous inches that will accumulate on the waist line if one decides to be a regular consumer of this product. Mouth watering! I'd have a problem of nibbling on this in secret ALL DAY...all by myself! sounds really easy, simple and tasty! and like the perfect thing to bake with my little buys as they love to taste the dough - which i really don't like them to do if it contains eggs. i just packed our rain coats away: that's it! no more rain here until october. 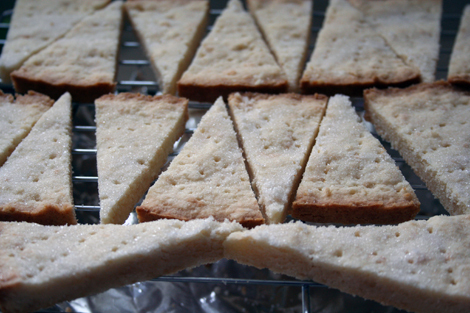 short bread - yummy, my very favourite... 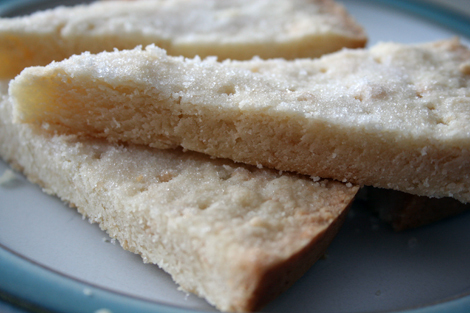 I just started a diet, can that include shortbread do you think??? Yum - I think we need to make some soon! Yes, and you are heading into the perfect season for baking.